I'm often asked, "does taking a photograph of a scene steal the moment from you?" This assumes that I'm so busy trying to capture the moment, that I actually end up not experiencing it. It's a valid point, and to some extent, true. What I experience is inevitably going to be different from what I would have, had I not taken the time to take the photograph. However, by taking the picture I feel I am even more aware of certain aspects of the scene, the light, the lay of the land, the smells and any movement that may be going on. I also find the very qualities from the scene that caught me eye in the first place are actually enhanced far more than they would have been had I just sat back and simply "soaked" up the moment. The picture below was captured during the first part of our ongoing project, The Great American Coastline. 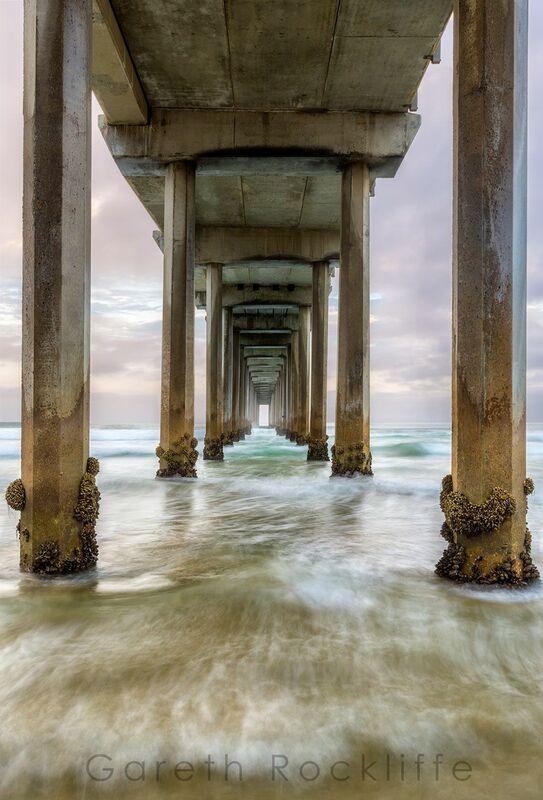 It was taken at Scripps Pier in La Jolla, Cal. When I look at the scene now, I can almost smell the salt air, almost feel the waves that were washing over my feet. I remember being impressed by the size and scale of the huge pier and how the ocean seemed to ignore this man made structure as it made its relentless journey to the shore crashing against the tall concrete pillars. I also remember how I got so carried away with the moment and trying to get a lower and lower perspective, that I fell over backwards and got soaking wet and ended up losing a set of filters. I remember all of these things when look at the image. The thing that also comes back to me was sitting in my van afterwards, soaking wet, cold and pissed I had lost hundreds of dollars worth of filters and then looking at the images on the back of the camera, getting excited by what I saw and thinking to myself, it was all worth it. So yes, taking a photograph can steal the moment, but, for me, it usually replaces it with something far richer and memorable!